Looking for an attractive and easy fruit tree for your yard? 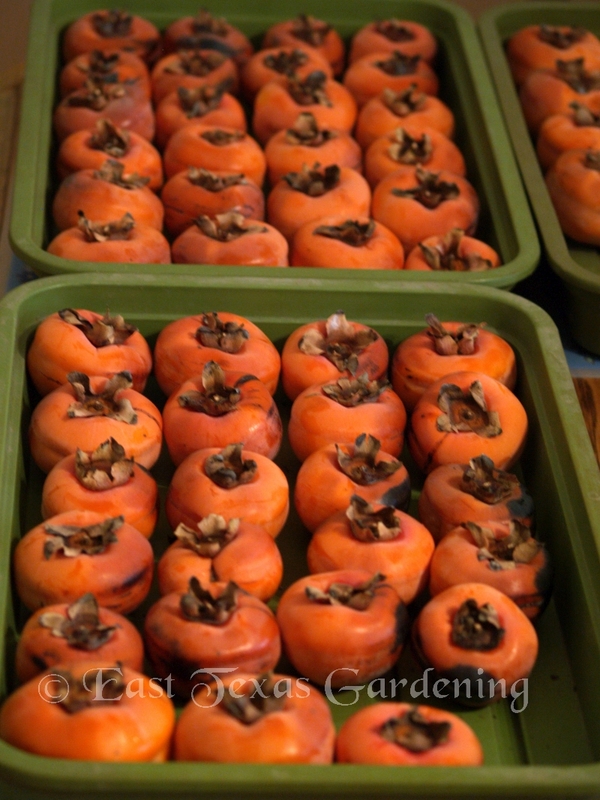 Try the oriental, Kaki or Japanese persimmon (Diospyros kaki). This handsome small tree is perfectly adapted to our area, relatively free of pests, easy to grow, and provides delicious and attractive fruit and colorful fall foliage ‑ what more could you want? Most folks don't notice oriental persimmons until the leaves have all fallen, revealing a bounty of bright orange globes hanging from the branches like ornaments. Oriental persimmon is related to, and sometimes grafted onto, the common American persimmon (D. virginiana), which grows wild across the south. American persimmon is a favorite of wildlife, especially racoons and opossums which relish the fruit. But, as anyone well knows who has ever bitten into one before it was ready, the unripened fruit can be a mouth‑puckering experience! Wild persimmons cannot be eaten until around the first frost and all the leaves have fallen from the tree, and even then they might still be astringent until they have completely softened. When ripe, they are delicious, having a sweet, nutty flavor. 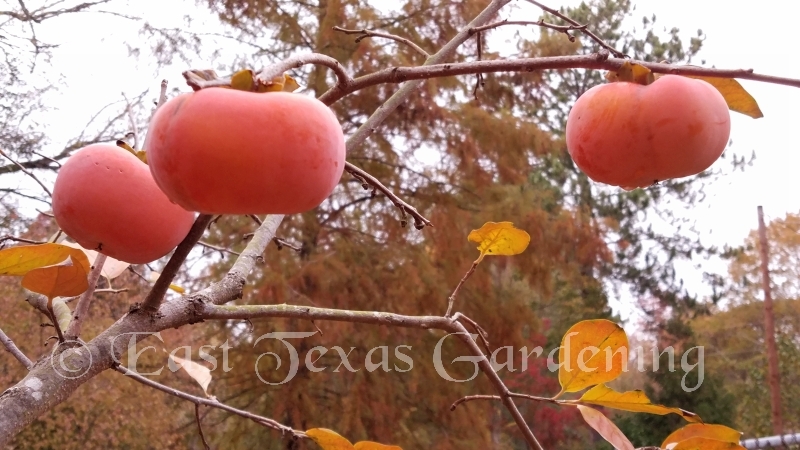 The oriental persimmon was introduced to the United States in the late 1800's from Asia where it is native and a very important crop. Many varieties have been named and cultivated in Japan for centuries. Unfortunately, most folks in this country are unfamiliar with its unique, sweet taste. 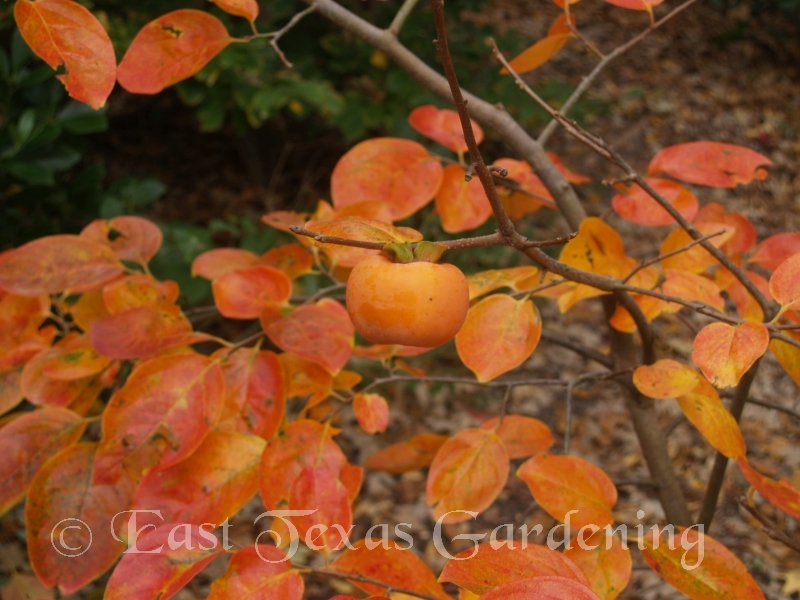 Japanese persimmon is well adapted to our area's climate and soils. It is hardy to 0 degrees F. and tolerates high summer temperatures. Like most fruit trees, it does best in a well‑drained soil. Because it has a very low chilling requirement to break dormancy, occasionally a late freeze may be damaging. 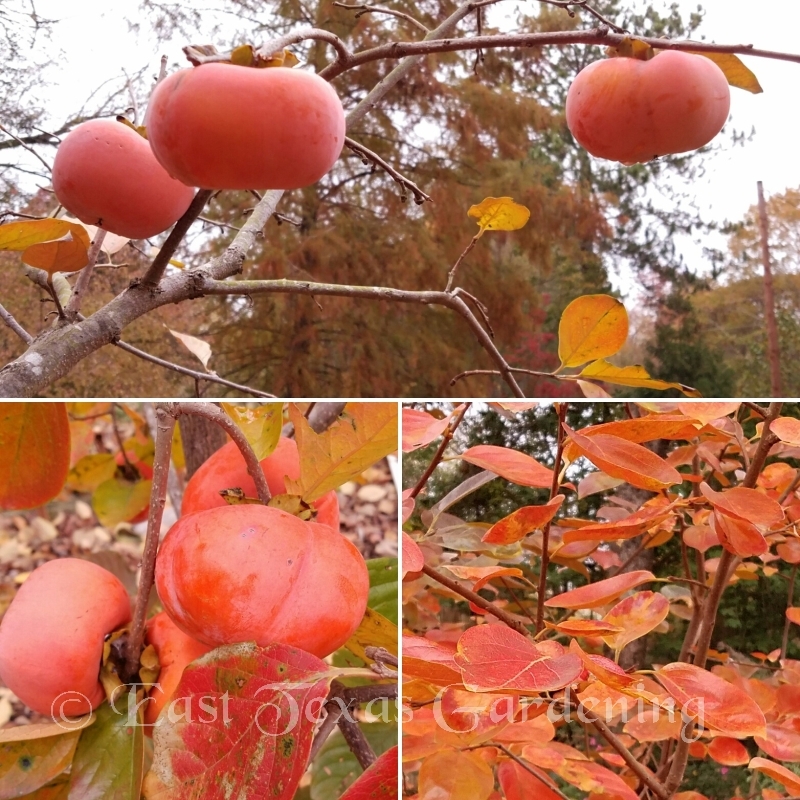 Fall color of Japanese persimmons is truly glorious, turning as orange as the fruit. The color is very reliable in the East Texas area, and a persimmon tree can be a fine ornamental addition to your yard. There are several named varieties of persimmon. When selecting cultivars, there are a couple of important things to note. First, unlike American persimmon, not all oriental persimmon varieties are astringent. Astringency makes them inedible until they have fully turned orange and softened, usually close to the first freeze, when they develop their characteristic sweetness and flavor. But, other varieties are nonastringent and can be eaten while still firm as they turn orange. Another important characteristic is some varieties require a pollinator, although most do not. Those that do not require a pollinator set fruit parthenocarpically ‑ that is, without pollination, just like figs. When pollination does occur, fruit will be seedy, and some claim, better tasting. The flesh develops dark streaks when seeds are present. Seedless, non‑pollinated fruit are more liable to drop prematurely during stressful, dry summers. The seeds within fruits help the fruit to stay more firmly attached to the plant. Oriental persimmons often drop most of their fruit prematurely the first few years after planting, until the tree becomes very well-established. 'Eureka' is a heavy producing, medium‑sized, flat‑shaped, orange-red variety of high quality. The fruit does contain seed and is astringent. 'Hachiya' is a productive, large, cone‑shaped, seedless, astringent variety with bright orange skin. The tree is vigorous, upright, with good ornamental quality. ‘Tanenashi is another highly ornamental variety. It is a cone‑shaped, orange fruited, astringent variety. The fruit store very well on the tree and are seedless. 'Tamopan' is a productive, large, orange, flat‑shaped, astringent variety with a ring constriction near the middle of the fruit. The tree is vigorous and upright. 'Fuyu' ('Fuyugaki') is a medium‑sized, non‑astringent, seedless variety. The orange fruit is flattened and of high quality. 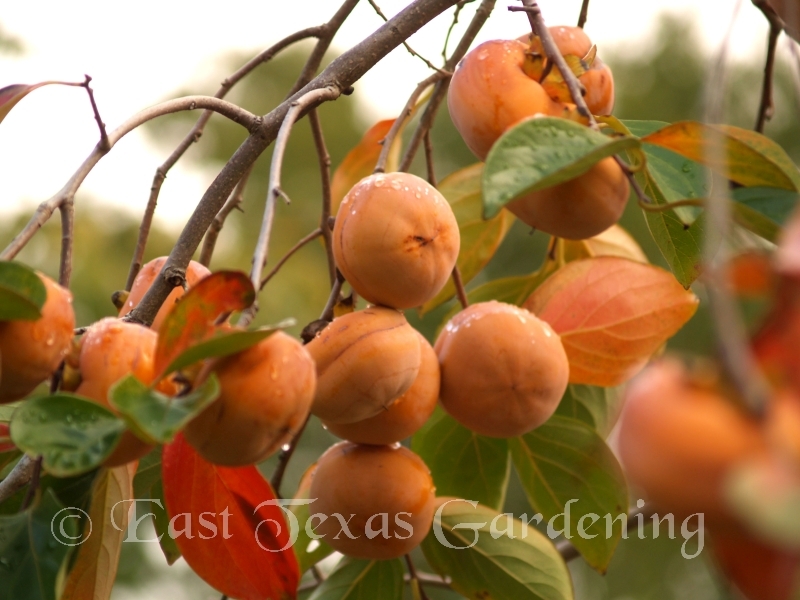 Persimmons should be planted in full sun, and in a well-drained soil. Planting bare root trees is at the same time as other fruit trees, in January and February as they become available in nurseries or through mail order. Plant trees about 15 feet apart. 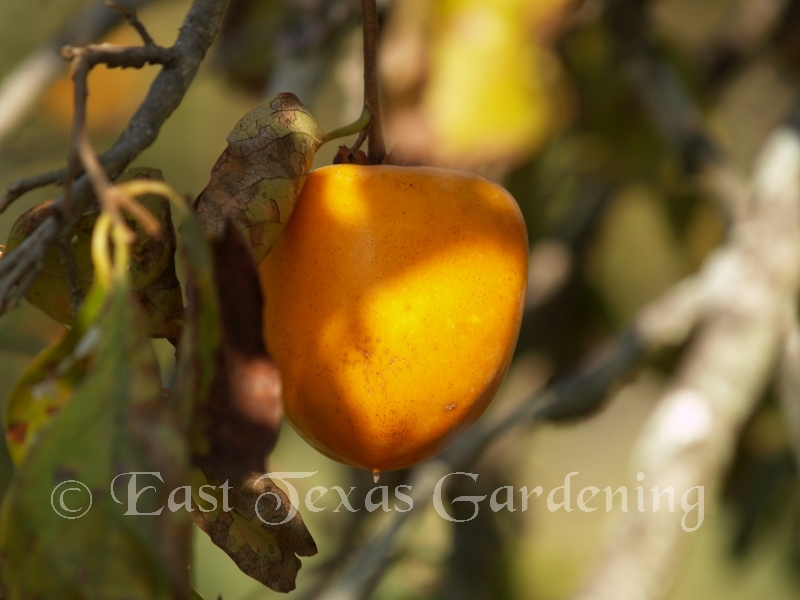 Although persimmons are drought tolerant, they will do much better, and hold their fruit better, if given regular watering during dry portions of the year, especially the first few years after planting. They do not need much fertilizer, mainly moderate amounts of nitrogen and potassium. Too much nitrogen may cause fruit to drop prematurely. Unlike peaches and plums which need regular pruning, persimmons only need pruning to help develop an attractive branching frame that would look good in the landscape and to develop a strong branches that will be able to bear a heavy crop of fruit. Newly planted persimmons should be trained to develop a central leader. Remove branches that develop narrow crotch angles with the trunk. Also remove vigorous, upright shoots and crossing or rubbing branches. Fruit should be thinned in late spring if there is a heavy fruit set. Leave 1 to 4 fruit per shoot, spaced about 6 inches apart. Persimmons tend to bear heavy every other year, with very few fruit in alternate years. Persimmons are harvested in the fall, but timing varies with variety, from October to late November, about the time of first frost. They may be stored on the tree, or harvested and kept at room temperature where they will continue to ripen and soften. Remove fruit from tree by cutting, leaving a bit of fruit stem attached. Mature, hard astringent persimmons can be stored in the refrigerator for 4 or 5 weeks. They may be frozen and kept for 6 to 8 months. They soften and are ready to eat when thawed. Non-astringent persimmons loose quality rapidly in the refrigerator. They may be stored for up to a week at room temperature. They can be eaten firm, like apples, or allowed to soften and eaten directly with a spoon or on cereal or pancakes. Persimmons can be eaten fresh by themselves or in salads, and are delicious in various baked goods like breads, puddings and pies.